In February 2009, Jonathan Lyons published 'The House of Wisdom', a riveting history which reveals the vital role the Islamic civilisation played in knowledge creation and how this treasure reached the West. In this fascinating and thoughtful book, Jonathan Lyons restores credit to the contribution of the Arabs and Muslims in the human long and patient effort of building human civilisation, explores and reveals the extent of their learning and describes the intrepid adventures of the European intellectuals of the high Middle Ages who went in search of it and who, in doing so, laid the foundations of what we now call the Renaissance. 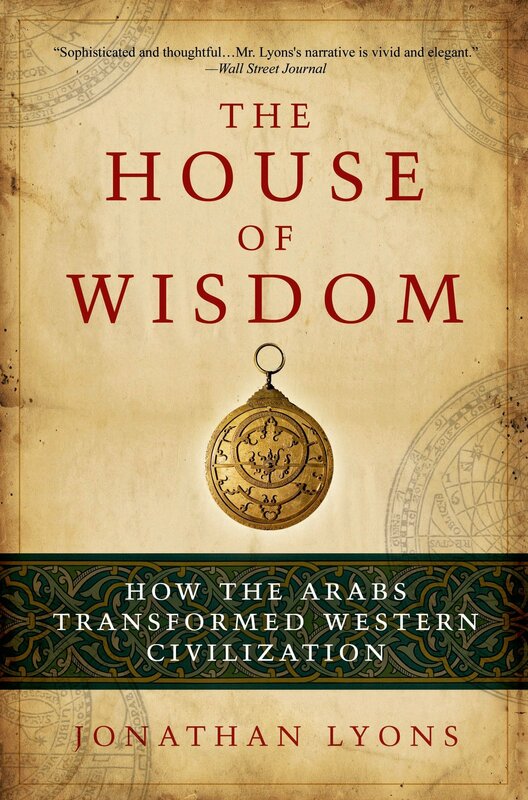 Book review of The House of Wisdom: How the Arabs Transformed Western Civilization By Jonathan Lyons. London: Bloomsbury Publishing, February 2009. Hardback, 272 pages. ISBN-10: 1596914599 - ISBN-13: 978-1596914599. Dimensions: 9.4 x 6.2 x 1.3 inches. Figure 1: Front cover of The House of Wisdom: How the Arabs Transformed Western Civilization by Jonathan Lyons (Bloomsbury, 2009). In his book The House of Wisdom: How the Arabs Transformed Western Civilization published recently, Jonathan Lyons describes the most salient aspects of the vibrant tradition of Islamic learning and narrates the fascinating story of the various ways in which this learning was transferred to the West and how it helped to transform profoundly Western civilisation in the later Middle Ages. The title of the book is inspired by the emblematic Abbasid academic institution Bayt al-hikma or the House of Wisdom, founded in Baghdad in the early 9th century. However, the book goes beyond this early episode of Islamic civilisation and lays a profound focus on the encounters between the East and West and how these encounters shaped the rise of the West. The structure of the book is arranged roughly according to the divisions of the times of prayers in Islam. The four parts of the book are entitled respectively Al-Isha/Nightfall (part 1), Al-Fajr/Dawn (part 2), Al-Zuhr/Midday (part 3), and Al-'Asr/Afternoon (part 4). They correspond to the raise of Islamic civilisation, the wide-ranging scope of its political and social power, coupled with a dynamic intellectual and scientific vitality, and its beneficial influence on the civilisation of the pre-modern Western world. This original structure of the book, organised in function of the daily Muslim prayer times, starts with Isha (nightfall) in the 10th century, when the Crusades first began and Europe was shrouded in darkness. Fajr (dawn) and Zuhr (midday) are devoted to a description of the events in the period around the 11th and 12th centuries when Muslim civilisation was at its zenith. 'Asr (afternoon) corresponds to the 14th century and marks the first appearance of "the West". Even though Lyons does not ask what happened at Maghrib (sunset), there is certainly an assumption that it represents the "end" or decline of science and learning in Islamic lands. However, such a view should take into account that the cyclic vision of civilisations must consider the role of interculturality in handing on the products of human spirit to the next civilisation, where they continue to live and to prosper in a new context. The historical context of the rise of civilisation in the lands conquered by Muslims since the middle of the 7th century and the context of the intercultural transmission of knowledge around the Mediterranean Sea can be summarized as follows. For centuries following the fall of Rome, Western Europe was backward and benighted, locked into the Dark Ages and barely able to tell the time of day. Augustine had decreed that belief, not reason, should be the guiding light of Christian thinking and partially as a result Europeans lived in a world of nominal literacy and subsistence farming, where blind faith, superstition and sorcery took the place of medicine, and the church harnessed nascent aggression among the kingdoms to its own ends in the pursuit of astonishingly violent and cruel holy wars - the Crusades. Islamic culture, however, was thriving and had become a powerhouse of intellectual exploration and discussion that dazzled the likes of Adelard of Bath who ventured to the Near East in search of the scientific riches pouring out of cities like Antioch, Baghdad or Cairo, whose libraries held hundred thousands books at a time when the best European libraries housed, at most, several dozen. In the frame of a dynamic scientific and intellectual tradition, the scholars of Islam could measure the earth's circumference, a feat not matched in the West for eight hundred years; they discovered algebra; were adept at astronomy and navigation, developed the astrolabe and other astronomical instruments, translated all the Greek scientific and philosophical texts, including the whole corpuses of Aristotle, Galen, Ptolemy, etc. ; they made paper, produced lenses and mirrors, and developed theoretical as well as practical branches of knowledge. Without them, and the knowledge that travellers like Adelard brought back to the West, Europe would in all likelihood have been a very different place over the last millennium. Figure 2: Photo of author and journalist Jonathan Lyons (Source). In this fascinating and thoughtful book Jonathan Lyons restores credit to the contributions of the classical world of Islam, explores and reveals the extent of their learning and describes the intrepid adventures of those who went in search of it and who, in doing so, laid the foundations of what we now call the Renaissance. The ability to accurately tell time and determine dates. Here, the chief instrument was the astrolabe, the most powerful analog computer before the modern age. The art of alchemy, forerunner of modern chemistry. Trigonometry and spherical geometry – invaluable for making maps, navigation, and locating cities. Algebra, geometry, trigonometry and our contemporary number system. Star tables and almanacs capable of predicting celestial events, like lunar eclipses, with considerable accuracy. Our modern technical lexicon: from azimuth to zenith, from alcohol to zero. Many of the foods we eat – apricots, oranges, artichokes, hard wheat for pasta, to name but a few. Natural philosophy, scientific cosmology and optics. And, most important of all, the notion that religion and science, faith and reason, could coexist; this gave medieval Western intellectuals ‘permission' to explore the universe without impinging on the majesty of God. Al-Khwarizmi: Mathematician and astronomer, born around 783 near the Aral Sea in modern-day Uzbekistan. He was affiliated with the House of Wisdom, and his star tables and works on arithmetic, algebra, the astrolabe, and the Hindu-Arabic numerals profoundly influenced the West. Al-Ma'mun: Abbasid caliph from 813 to 833. He took a direct interest in science and philosophy and actively promoted scholars at the House of Wisdom and elsewhere. Ibn Sina (Avicenna): 11th-century polymath and leading Muslim philosopher and medical scholar. His influence on Western culture lasted for centuries, in various fields, from philosophy to medicine. Ibn Rushd (Averroes): The famous Andalusian philosopher Abu 'l-Walid Muhammed Ibn Ahmad Ibn Rushd. He flourished in Cordoba and Marrakech in the 12th century. He exerted an enormous influence on Christian and Jewish thought, primarily as a commentator on Aristotle, and also as an original author in philosophy, logic, astronomy and medicine. Al-Idrisi (Dreses): North African geographer and scientific director of King Roger II of Sicily's World Map project, completed in 1154. Adelard of Bath: Pioneering explorer of the Islamic learning, who brought the wonders of geometry, astronomy and other fields to the medieval West. Frederick II: The Holy Roman Emperor and enthusiastic proponent of Arabic culture. He was patron of Michael Scot and underwrote translations of Ibn Rushd's commentaries on the Aristotelian corpus. Figure 3: Aristotle teaching astronomy. The Arab scientific tradition was greatly influenced by the work of the classical Greek scholars, whose "natural philosophy" represented a complete system of knowledge that encompassed both the physical sciences and metaphysics, and upon which the scholars of the Islamic tradition commented extensively. © Topkapi Palace Museum, Istanbul (Source: House of Wisdom Gallery). Bayt al-hikma or The House of Wisdom was a scientific institution founded in Baghdad by the caliph al-Ma'mun. Its principal activity was the translation of philosophical and scientific works from the Greek originals which, according to tradition, a delegation sent by the caliph had brought from the country of Rum. Its directors were Sahl b. Harun and Salm, assisted by Sa'id b. Harun. It included an important staff of translators, of whom the most famous were the Banu 'l-Munaddjdjim, as well as copyists and binders. It appears in fact that the library so constituted, and often called Khizanat al-hikma, had already existed in the time of Harun al-Rashid and the Barmakids who had begun to have Greek works translated. Al-Ma'mun may only have given a new impetus to this movement, which was to exert a considerable influence of the development of Islamic thought and culture. To the same institution were attached two astronomical observatories (marasid), one installed at Baghdad, the other at Damascus, where Muslim scholars devised in particular new astronomical tables (zij or zidj), correcting the astronomical data inherited from the ancient, especially those furnished by Ptolemy. The Bayt al-hikma properly so called does not appear to have survived the reign of the Abbasid Caliph al-Mutawakkil, which began with a sensible political shift from that of his immediate predecessors, although there is subsequent mention in Iraq, during the 3rd/9th century, of several scientific libraries, owing their existence to private initiative and the fact that the caliph al-Mu'tadhid had sought to favour the work of various scholars whom he had installed in his place. Only the Fatimids were later to found similar official academies, of which the most important was the Dar al-hikma established by Al-Hakim in 395/1005. Indeed, since the short-lived appearance of the Bayt al-hikma of al-Ma'mun, several libraries had been founded in Iraq and Persia providing not only information on traditional learning, but also an introduction to classical sciences ('ulum al-awa'il).Such establishments were very successful in Egypt under the Fatimids, where Shi'idoctrines provided a favourable climate for the development of Greek sciences. The Cairo palace soon housed a large collection, and one of its librarians was the writer al-Shabushti(d. 388/998). The vizier of al-'Aziz, Ya'qub b. ?illis (d. 380/990), organized meetings of men of letters, jurists, and theologians in his own residence, and granted them financial allowances, but this initiative was soon over-shadowed by the Dar al-hikma (sometimes dar al-'ilm) which Al-Hakim housed in the north-western part of the western Palace. It contained a library and reading-room, and served as a meeting-place for traditionists, jurists, grammarians, doctors, astronomers, logicians and mathematicians. The Cairo Dar al-hikma was administered by the Da'ial-du'at, who invited learned men to meet there twice weekly. It was closely associated with the propagation of Shi'idoctrine, and charged to give instruction in Isma'ilidoctrine, which has also been called hikma since the time of al-Mu'izz. In 435/1045 a new catalogue was prepared, and it listed at least 6500 volumes on astronomy, architecture and falsafa (philosophy). The institute was closed at the end of the 5th/11th century by the vizier al-Aftal, but al-Ma'mun reopened it in 517 H/1123 CE in another building, to the south of the eastern Palace. It had already been looted in 461 H/1068 CE, in the reign of al-Muntasir during the civil wars, and when the Fatimid dynasty came to an end (in 567 H/1171 CE) the library was once more closed. Salah al-Din Al-Ayyubi sold the palace treasures, including the books, but fortunately some of them were re-purchased by enlightened men and therefore preserved. Figure 4: A page from the manuscript of Al-Qanun fi 'l-tib (The Canon of Medicine) by Ibn Sina, written in the 11th century. It served as the leading medical text in the West for more than five hundred years. © National Museum, Damascus (Source). When Baghdad opened its gates as the new capital of the Abbasid Caliphate, the prime site in the city was occupied by the royal library. Both the city and the library, completed around 765, were built by Caliph al-Mansur, who devised a method for measuring the circumference of the Earth and was second in a long line of Abbasid caliphs who valued thought and learning above all else. The Abbasids created, shaped and developed one of the most rich and fertile periods of science in human history. The library was officially called "the House of Wisdom". It was a monumental structure, accommodating translators, copyists, scholars, scientists, librarians and the swelling volumes of Persian, Sanskrit and Greek texts that flooded into Baghdad. Not surprisingly, it became a magnet for seekers of knowledge from across the Muslim empire. Jonathan Lyons tells the story of the House of Wisdom, the caliphs who supported it and the people who worked there, at a riveting, breakneck pace. In quick succession we meet scholars such as al-Khwarizimi, the illustrious Muslim mathematician and founder of algebra, the geographer al-Mas'udi, who described major sea routes to Persia, Cambodia and as far as the Malay peninsula in The Book of Roads and Kingdoms, and al-Kindi, the first Arab philosopher. But Lyons is more concerned with how what was happening in Baghdad and other Muslim cities was transferred to Europe. So he focuses on a string of colourful translators and scholars who travelled to the Muslim world and took its knowledge and discoveries back with them. Adelard of Bath, for example, travelled to Antioch and Sicily in his dogged pursuit of what he called studia arabum, the learning of the Arabs. An early pioneer of Arabic teaching, he translated numerous works of spherical and theoretical astronomy, including al-Khwarizimi's astronomical tables, which introduced a new body and vocabulary of mathematical knowledge to the West. His translation work enabled Adelard to write his treatise on the use of the astrolabe, which revolutionised the way Western men understood the Universe. Another Briton, Michael Scot, could not get enough of Muslim learning. His extensive translations of the works of Ibn Rushd and Ibn Sina, undertaken during the 13th century, introduce corpus of Greek and Arabic philosophy to the West. Figure 5: A Muslim and a Christian playing a duet on the lute in 13th-century Spain. This work was dedicated to Alfonso the Wise, the Christian ruler of Castile, Leon, and Galicia. © Monasterio de El Escorial, El Escorial, Spain/The Bridgeman Art Library (Source). But interest in Arabic learning was not limited to scholars and translators. Many rulers, such as the Holy Roman Emperor Fredrick II, realised that Arab knowledge was a source of power. Europe knew that the scholars of Islam phisticated navigation techniques; and books such as al-Biruni's The Determination of the Coordinates of Cities could provide accurate methods for determining geographic locations. It was this realisation that motivated the upstart king of the once-Muslim Sicily, Roger II, to commission the first global map of the world from the Muslim geographer al-Idrisi. The map, completed about 1138, depicted the world as occupying one full hemisphere, or 180 degrees, stretching from Korea in the East to the Canary Islands in the West. Al-Idrisi also wrote an accompanying text, Amusements for Those Who Long to Traverse the Horizon, known as The Book of Roger, which provided a description of the peoples, lands and cultures of the seven climates. Islamic thought and learning transformed medieval Christendom beyond recognition, Lyons writes. A key import was natural philosophy, the precursor to modern science, and the idea that came with it: the notion of a university as an intellectual, cultural and social institution. Roger Bacon, the 13th-century English scientist and philosopher, travelled through Muslim Spain dressed as an Arab and was among the first to teach natural philosophy in Paris. Without these imports, Lyons says, the Renaissance would not have been possible and European "progress" as we know it would have been inconceivable. Arabic learning gave Europeans their ideological and intellectual identity - indeed, Lyons suggests, "the West" itself is a Muslim invention. But the West's gratitude to Islam was expressed in its willful forgetting of the debt it owed to the Muslim world. This process began with the successors of Adelard and Scot and had four core themes: Islam distorts the word of God; it is spread solely by the sword; it perverts human sexuality; and its prophet, Muhammad, was a charlatan, an anti-Christ. It was thus necessary to write the Arab learning out of history and to claim direct descent from Greece. As Petrarch, one of the most prominent 14th-century anti-Arab intellectuals, declared: "I shall scarcely be persuaded that anything good can come from Arabia." Scot's mastery of Arab learning led Dante to dump him in the lower depths of Hell, among the sorcerers. Thanks to enlightened modern efforts, such as those of Jonathan Lyons and others, those simplistic judgements, founded on religious hostility rather than being rooted in real historical facts, are decisively corrected. Figure 6: A European copy of al-Idrisi's map of the world, originally created at the commission of Roger II the ruler of Sicily, in the mid-12th century. © Bibliothèque Nationale de France, Paris (Source). In his review of two books published recently on Muslim Heritage and its impact on world science, Philip Ball wrote in the The Sunday Times: "Last November , scientists using the Hubble space telescope reported the first sighting with visible light of a planet circling a star other than our own sun. It orbits 25 light years away around one of the brightest stars in the sky, called Fomalhaut. Isn't that a curious name for a star? Not obviously mythological, it sounds as if it derives from some forgotten French astronomer. Not so; it is, in fact, from the Arabic fum u'l haut, meaning 'mouth of the fish'. And Fomalhaut is not alone in having an Arabic derivation - there are well over 100 others, including Betelgeuse, Aldebaran and Deneb. How did the Arabs get to name stars?" The answer is that they once led the world in astronomy. Muslim scientists were mapping the heavens, and pondering our place in them, while Europeans were still gazing at the night sky with baffled awe. To judge from some scientific narratives, the baton of knowledge about astronomy passed directly from the Greek Ptolemy in the 2nd century CE to Copernicus in the Renaissance. In fact, just about everything that the Western world knew of the celestial sphere in the 16th century had come to it via Arabic learning, including Ptolemy's works, which were translated and refined between the 9th and the 13th centuries. Actually, the scholars of Islam didn't just read Ptolemy; they added to and challenged him, with data gathered at observatories such as the one established in the 820s in Baghdad by the greatest of the "scientific" rulers, al-Mamun of the Abbasid caliphate. Astronomy is just one example of the enormous debt that the West owes to the achievements of Islamic science during the periods we still insist on calling the Dark and Middle Ages. While Europeans struggled until at least the 12th century with the mere rudiments of mathematics and natural philosophy, the Abbasid caliphs of the 8th to 13th centuries were promoting a rationalistic vision of Islam within which it was a sacred duty to inquire into the workings of the world. This programme was founded on the remnants of Roman and Hellenic culture, to which the Muslims had direct access in centres such as Alexandria, Harran and all intellectual centres of that Middle East they pacified and unified. They prepared Arabic versions of the works of Aristotle, Euclid, Ptolemy and Archimedes, and set up schools and libraries such as the House of Wisdom in Baghdad. As well as preserving classical scholarship, Muslim thinkers also innovated in many fields: astronomy, optics, cartography and medicine. The camera obscura, for instance, a kind of pinhole camera in which an outside scene is projected onto a wall in a darkened chamber as light enters through a small hole, was first studied experimentally by the Iraqi physicist and mathematician who settled in Egypt Al-Hassan ibn al-Haytham (Alhazen) in the 11th century. Roger Bacon later used the device to study solar eclipses, and old masters from Van Eyck to Vermeer may have employed the projection method to achieve their micro-realist detail. Islamic mapmakers, meanwhile, were drawing recognisable outlines of Europe, the Gulf and the Indian subcontinent while Westerners were still dividing a disc world into absurdly stylised quadrants. (It was a Muslim map that guided Vasco da Gama beyond the Cape of Good Hope to India at the end of the 15th century.) And in chemistry the Arabs went far beyond the tentative efforts of the classical world, bequeathing us words such as alkali and alcohol, alembic, elixir and alchemy. The standard theory of the alchemical transmutation of metals was laid out in the writings ascribed to the 8th-century scholar Jabir ibn-Hayyan, in which nitric, hydrochloric and sulphuric acids - central to practical chemistry then and now - made their debut. The Muslims also benefited from contact with China, from where they learnt how to make paper, and India, from where they got the "Arabic" numerals that were far superior to the cumbersome Roman system for arithmetic calculations, along with the concept of zero (the word itself is Arabic). These and other discoveries were passed on to the West in due course. The fruits of the golden age of Islamic science are summarised briskly and engagingly in the book of Jonathan Lyons. His book, The House of Wisdom is keen to dismantle the myth that Islam is fundamentally opposed to science, and he shows clearly that the Islamic civilisation was driven by a strong thirst for knowledge and rational inquiry. Lyons's more specific focus is on the story of how this knowledge opened Western eyes in the 12th century, a period now regarded as a kind of medieval renaissance. The hero of his book is an Englishman, Adelard of Bath, one of the few Europeans open-minded enough to see that they had much to learn from the "heathens". Too often dismissed as a mere translator, Adelard not only gave the West its first view of Euclid's Elements and the astronomy and algebra of the Baghdad mathematician al-Khwarizmi (whose name is preserved now in the word algorithm), but was also an original thinker who helped introduce medieval Europe to the Islamic vision of a universe governed by the rational design of a hands-off God. Figure 7: In November, scientists using the Hubble space telescope reported the first sighting with visible light of a planet circling a star other than our sun. The discovered planet orbits 25 light years away around one of the brightest stars in the sky, called Fomalhaut or Alpha Piscis Austrini (Source). The name Fomalhaut is derived from fum u'l hût (mouth of the fish), the Arabic initial name of this star. Fomalhaut is not alone in having an Arabic origin: there are well over 100 other stars, including Betelgeuse, Aldebaran and Deneb (see FSTC, Arabic Star Names: A Treasure of Knowledge Shared by the World). Probably, it is in Chapter 2, entitled "The Earth Is Like a Wheel", that Jonathan Lyons' objective in the book is the most apparent. Here the author describes the state of knowledge, or rather absence of secular knowledge, that characterized Europe during the Middle Ages. In contrast with the thriving later intellectual tradition that flourished in Europe from the 17th century, the second chapter of Jonathan Lyons' book describes how European intellectuals in the Middle Ages were knocking on the gates of the learned and sophisticated Islamic lands. He explains that Fibonnaci's father sent him to a Muslim family to learn his math - he would have learned double-entry bookkeeping, an innovation that had not yet reached the North. When European monestaries might hold a couple of dozen volumes, Arabic libraries held hundreds of thousands of books. When a Muslim ruler decided to donate books to a new school, he sent 80,000 from his personal collection. Adelard of Bath was born around 1080 in England's west country. His father was a powerful ally of the local bishop, and he was a wealthy, highly educated man who'd studied at cathedral schools in France. But he condemned contemporary learning and longed for an idealized past - "I judge the ancients eloquent and call the moderns dumb." He had no interest in crusading. Instead, he resolved to learn Arabic and return with Arabic learning. We believe he was in Antioch in 1114, based on evidence of an earthquake he survived. He know he learned to wash a cadaver until the neural systems emerge from under the skin to study their structure. He came home a changed man, determined to teach his peers about the wonders he studied in the East. He is worried that his peers reject modern scholarship from the Arab world at their peril and overfocus (as he had) on the classics of Greek literature. He brings back a book of alchemy which teaches how to tan leather, color glass and dye cloth green. And he brings back the astrolabe, the most powerful computer of its day, capable of telling time, defining true north, and measuring the height of a building. Alas, they only work if you know the latitude - we can read astrolabes based on what latitude they're set up for. "Seven years before the earthquake that shook the moral foundations of Crusader Antioch, Adelard surveyed the world around him and pronounced it rotten. His recent studies at the famed French cathedral school at Tours had provided him with the best education of his day. He enjoyed the support and patronage of the powerful bishop of Bath, the French court physician and scholar John de Villula. He practiced the art of hunting with falcons, a sign of his noble rank and the life of leisure it generally afforded. And he was an accomplished musician, who years later still fondly recalled the time he had been invited to play the cithara, a forerunner of the guitar, for the queen. "In short, Adelard of Bath was the model country gentleman. His father, Fastrad, was one of Bishop John's richest tenants and most senior aides, ensuring a life of privilege for his son. The family appears sporadically in official documents of Church and state. The Pipe Rolls, or royal accounts, later list Adelard as the beneficiary of a pension from the revenues of Wiltshire, in southwest England. Still, young Adelard saw little of value in the contemporary world, and he despaired at the state of Western learning in particular. "When I examine the famous writings of the ancients – not all of them, but most – and compare their talents with the knowledge of the moderns, I judge the ancients eloquent, and call the moderns dumb," he proclaimed in the opening line of his coming-of-age essay and first known work, On the Same and the Different. "Adelard's disdain for the "the moderns" was understandable, for the West at the end of the 11th century was a mess. Daily life staggered under the burden of rampant violence and social instability. Bands of mercenaries, answerable neither to king nor God, prowled the countryside, their commanders' word the only law of the land. Across Europe, primitive farming techniques could no longer keep pace with a growing population, while antiquated inheritance laws left many impoverished and desperate. Violence – inflamed by the weakness of central political authority and uninhibited by the tenuous moral grip of the Catholic Church – was the currency of the day. As Pope Urban had acknowledged at Clermont when he called the First Crusade, religious leaders were helpless to halt the chaos across the continent. The best the Church could do was to redirect its flock's baser nature against the infidels to the East. "Not even Adelard's remote corner of England was immune to the troubles. It was just two decades since the Norman Conquest, and political and social strife still plagued the land. The uneasy relationship – for centuries punctuated by bouts of armed conflict – between what today comprise the distinct nations of England and France was a regular feature of late medieval life. At the same time, political, cultural, and personal ties ran deep, and so it was not surprising that Adelard could pursue higher education in Tours and that many leading officials and courtiers, like Bishop John, hailed from the European mainland. In 1086, as a young child, Adelard had seen his native West Country town of Bath, including its once-proud abbey of black-robed monks, almost burned to the ground during an uprising against the heir to the throne, William the Red [William Rufus]. The rebels had hoped to secure the rule of William's brother, Robert of Normandy, but their bid for power ended in bloody failure and considerable destruction. Robert, eldest son of William the Conqueror, later died a royal prisoner. "Things were little better inside the elite cathedral schools. The chaos and disorder that swept in with the barbarian invasions of the western Roman Empire, beginning in the 4th century CE, had just about destroyed formal education and the perpetuation of classical knowledge. The Muslim conquests three hundred years later sealed the West's isolation by choking off easy access to the Byzantine Christians based in far-off Constantinople, where some traces of the Greek intellectual tradition could still be found. The wonders of classical learning were all but forgotten, or at the best pushed to the extreme margins of European consciousness. Invaluable texts were lost through inattention, destroyed by the illiterate hordes, or simply rendered unintelligible by the general ignorance of would-be scholars or simply by the lost ability to read Greek. The aristocracy of the Roman Empire read the Greek masters in the original, so there was no need at the time for Latin translations of the philosophy of Plato and Aristotle, the engineering wonders of Archimedes, or the geometry of Euclid. The wholesale disappearance of Greek as the language of learning meant centuries of knowledge virtually vanished from the collective mind of Latin-speaking Europe. Figure 8: Photo of Dar Al-Hekma College in Jeddah, Kingdom of Saudi Arabia. The name of the college refers to the importance of the name to the memory of the Arab people. Dar Al-Hekma College is a private higher education institution. Its mission is to provide selected degree programmes of the highest quality to academically qualified women. The College fosters creativity and emphasizes the important role in society of women as the first builders of the family and the first educators of the nation. "There were a few outposts – scattered monasteries in Ireland, northern England, Catalonia, and southern Italy – where the monks laboured to keep the classical traditions alive. Yet the results were meagre in comparison to the heights once scaled by the Greeks, or to the new and exciting work being carried out in the Arab world. At the West's leading centre of mathematical studies, the cathedral school of Laon, the best minds of Adelard's day had no grasp of the use of zero. The masters at Laon taught the latest techniques employed by King Henry I, who ruled both England and Normandy in the early 12th century, to manage his treasury. These included the use of a special tablecloth, marked out in rows and columns like a chessboard, and based on the principles of the abacus which had reached France from Arab Spain some years before. The cloth was known as the scaccarium, Latin for chessboard, and is the origin of the English term for the treasury, "the Exchequer." Despite the importance of this royal mission, the standard of learning at Laon remained very low; one contemporary textbook reveals consistent errors in even the most basic calculations. "More vexing than sloppy royal accounting was the inability to measure the hours of the day or keep the calendar. Even by the sleepy standards of medieval Christendom, time was a serious business, linked as it was with the pursuit of heavenly salvation. The Rule of St. Benedict, which governed tens of thousands of monasteries from the 6th century onwards, required eight sets of prayers at specific times every twenty-four hours. The practice was based on a reading of two verses in Psalm 119: "Seven times a day I praise thee" and "At midnight I rise to give thee thanks." This was relatively simple during the day, when the changing position of the sun could provide a rough guide to the hour, but at night the monks of the Latin West were left literally in the darkness of their own ignorance". Author and journalist Jonathan Lyons has spent his professional and personal life exploring the shifting boundaries between East and West. After more than 20 years as an editor and foreign correspondent for Reuters — mostly in the Muslim world —, he is now a researcher at the Global Terrorism Research Centre and a PhD candidate in sociology of religion at Monash University in Melbourne, Australia. He lives in Washington DC and teaches courses on Islam and how to cover it journalistically at George Mason University in Virginia, USA. For more information on the author and the book, visit: www.jonathanlyonsportfolio.com. Abu-Fadil, Magda, The House of Wisdom: How the Arabs Transformed Western Civilization. Posted February 2, 2009: book review and author interview. Al-Khalili, Jim, It's Time to Herald the Arabic Science That Prefigured Darwin and Newton. Published 3 January 2009 on www.MuslimHeritage.com. 'Awwad, Kurkis, Khaza'in kutub al-'iraq al-'amma, in Sumer (Baghdad), vol. ii, 2, 1946, pp. 214-218. Buchan, James, Invaders of the mind, The Guardian, 28 February 2009. Burnett, Charles, Mont Saint-Michel or Toledo: Greek or Arabic Sources for Medieval European Culture? Published 25 February 2009 on www.MuslimHeritage.com. Burnett, Charles, The Appreciation of Arabic Science and Technology in the Middle Ages. Published 16 May 2007 on www.MuslimHeritage.com. Burnett, Charles, Tracing the Impact of Latin Translations of Arabic Texts on European Society. Published 1 July 2008 on www.MuslimHeritage.com. FSTC, The Impact of Islamic Science and Learning on England: Adelard of Bath and Daniel of Morley. Published 13 October 2004 on www.MuslimHeritage.com. Folkerts, Menso, and Lorch, Richard, The Arabic Sources of Jordanus de Nemore. Published 11 July 2007 on www.MuslimHeritage.com. FSTC, Muslim Scholars: Muslim Scholars of the Past is a huge list of analytic and historical biographies compiled by FSTC Research Division about famous Muslim Scholars of the past: click to browse through the list, by name or by year. FSTC, Scientific Contacts and Influences Between the Islamic World and Europe: The Case of Astronomy. Published 25 January 2007 on www.MuslimHeritage.com. FSTC, A Plea for the Recovery of the Forgotten History of Muslim Heritage. Published 10 January 2009 on www.MuslimHeritage.com. Recognizing a Decisive Tribute: Islam's Contribution to Western Civilization. (Review of What Islam Did For Us: Understanding Islam's Contribution to Western Civilization by Tim Wallace-Murphy, Watkins Publishing, 2006). Published 4 September 2007on www.MuslimHeritage.com. FSTC, How Islam Created the Modern World. (Review of How Islam Created the Modern World by Mark Graham, Amana Publications, 2006). Published 13 September 2007 on www.MuslimHeritage.com. FSTC, Remembering the Language of History and Science: When the World Spoke Arabic. Published 1 January 2009 on www.MuslimHeritage.com. Healey, John, The Syriac-speaking Christians and the Translation of Greek Science into Arabic. Published 2 April 2007 on www.MuslimHeritage.com. Mubaidin, Omar, Tentative Global Timeline of Contacts between the World of Islam and Western Europe: 7th -20th Centuries. Published 19 February 2008 on www.MuslimHeritage.com. Khan, Yasmin, Shining light upon light. Published 3 April 2009 on www.MuslimHeritage.com). Ormsby, Eric The Islamic Enlightenment: Recalling an era when science and scholarship were prized, Wall Street Journal, 14 February 2009. O'Shea, Stephen, The House of Wisdom' by Jonathan Lyons. A look at the significant impact of the Arabic world on Western civilization, Los Angeles Times, March 27 2009. Pinto, O., Le biblioteche degli Arabi nell'eta degli Abbassidi, Florence 1928, pp. 12-14. Rifa'i, A. F., 'Asr al-Ma'mun, Cairo 1928, vol. 1, pp. 375-76. Sardar, Ziauddin, "Book Review: The House of Wisdom: How the Arabs Transformed Western Civilization by Jonathan Lyons", The Times, 22 January 2009. Sourdel, D. "Bayt al-Hikma." Encyclopaedia of Islam, Second Edition, vol. I, p. 1141, column 1. Sourdel, D. "Dar al-hikma." Encyclopaedia of Islam, Second Edition, vol. II, p. 126, column 2.